We’re very disappointed to see the Gold Coast City Council choosing unqualified opinion over science. The Gold Coast Bulletin yesterday published the article ‘Gold Coast councillor says birds are dying in toxic water while campaigners try to stop Black Swan Lake being filled‘. The article, and Councillor Gary Baildon’s statement, do not reflect the facts or the scientific evidence for the lake. Cr Baildon this morning pointed to a 2014 report by a Wildlife Relocation Management Services which showed the water was toxic and dead birds had been found around the lake. But! Wildlife Relocation Management Services is fauna spotter-catcher service – not an ecologist or water scientist and thus not qualified to make these assertions. This is not the standard of reporting one should refer to, to try and counteract independent water quality analysis reporting by accredited scientists. “While this is occurring birds and animals are dying over in that waterhole and it needs to happen as quickly as possible,” Cr Baildon said. But! We haven’t seen the evidence that any water quality issues, at the lake, which could lead to wildlife deaths. Cr Baildon said recent council tests had found the water to be high in phosphorous and nitrogen. But! B4C’s Operations Manager and Ecologist, Stefan Hattingh, says there is a higher chance of the waterfowl dying from mouldy weed and grain, from the horse stables, than from micro-nutrient levels currently in the water, as identified by water testing reports. “Even if you went to settlement ponds in sewerage works where the water has far higher levels of nitrogen and phosphorous, and see the birds there, it doesn’t harm them even at those levels,” Stefan says. 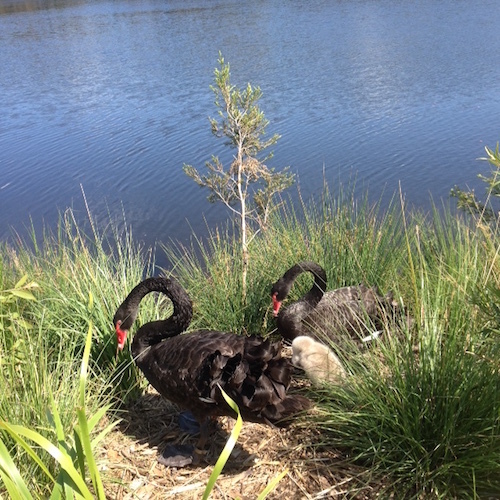 Black swans with cygnet at Black Swan Lake. B4C has published two professional and detailed water quality reports. View the Water report – 2014 (PDF) and the Water report – 2016 (PDF). Council has been presented with these reports but never refers to them. The water samples were sent for independent analysis at Australian Laboratory Services, a NATA accredited laboratory for the method of analysis being used. B4C’s Catchment Manager Wayne Cameron says it appears that Council avoided factoring in point-source feral pigeon controls and stock-piling of horse manure, adjacent to the lake. “How do you claim a lake is toxic without referring to accredited water testing reports?” Wayne says. We hope to see both the council and the Gold Coast Bulletin using information from qualified and accurate sources. The petition to stop the filling in of Black Swan Lake has over 12,000 signatures. View and sign here. What do we have to do to attract attention of the elected representatives of the Gold Coast and the media? The community deserves the facts. Black Swan Lake, Gold Coast.